Get the Raw.Honest.Loved. Project to teens in Iowa! Even the smallest donation helps and is greatly appreciated. 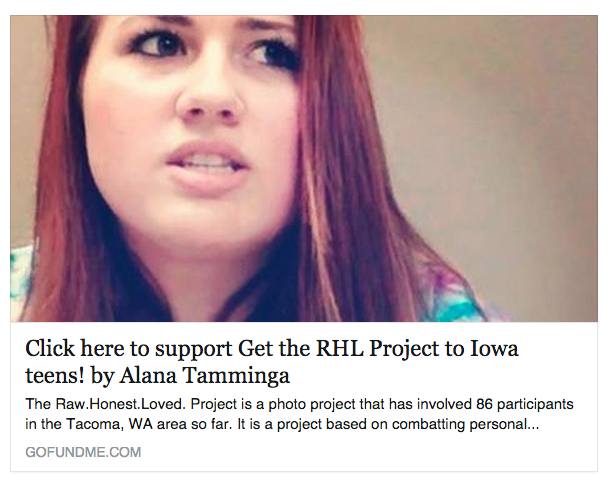 Recently, this Tacoma, WA based project was contacted by Rebecca, a high-school senior that lives in the small town of Decorah, Iowa. She had found the project through a friend and Facebook and hoped it could possibly make some sort of change for teens in her area. Rebecca is very familiar with loss in her community – when we originally became acquainted, their community had dealt with the death of five young people over only the last few years – two to accidents, three to suicide. Since our original contact, Rebecca lost yet another friend to suicide just a couple of weeks ago. She and I recently got to FaceTime about self-esteem, its effects, suicide, and the RHL Project. I am excited to announce that there is now an opportunity for us to go to Iowa to do the project with Rebecca and six of her peers. If you are able to help us in any way toward this cause, we and this group of teens would greatly appreciate it. We need to round up funds for this quickly, as this group needs to take place at the end of April. We’re very excited about this opportunity! Please share if you feel so inclined. Please go here for the GoFundMe Link: Get the Raw.Honest.Loved. Project to Iowa!